Revenue in the Non-Carbonated Soft Drinks segment amounts to US$33,659m in 2019. The market is expected to grow annually by 0.7% (CAGR 2019-2023). In global comparison, most revenue is generated in Japan (US$35,609m in 2019). In relation to total population figures, per person revenues of US$102.28 are generated in 2019. The average per capita consumption stands at 56.1 L in 2019. Non-Carbonated Soft Drinks here sum up non-alcoholic liquid refreshment beverages that are not artificially carbonated. These include a variety of drinks like fruit juice nectars (with a fruit juice content of 25-99%), fruit-juice-based refreshment beverages (with a fruit juice content of less than 25%), ready-to-drink (RTD) tea and coffee beverages as well as valued-added or flavoured water. Non-Alcoholic beer also falls into this category as its carbon dixode is a natural result of the brewing process. While fruit nectars have lost some ground to juices with 100% fruit juice content and are generally under pressure because of their relatively high sugar content, RTD tea and coffee beverages as well as non-alcoholic beer have performed very well in recent years as consumers in the West seek out novel refreshment options. In the Asia-Pacific region this category has been traditionally stronger than carbonates and has been fuelled by the general economic development in these countries. Reading Support Revenue in the Non-Carbonated Soft Drinks segment amounts to US$33,659m in 2019. 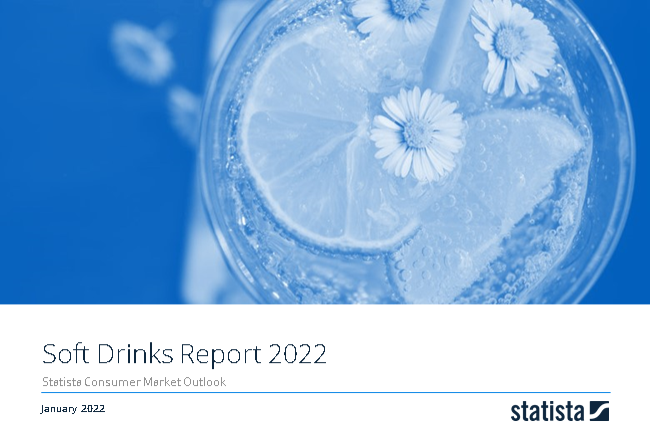 Reading Support The Non-Carbonated Soft Drinks segment is expected to show a revenue growth of 0.6% in 2020. Reading Support The average revenue per person in the market for Non-Carbonated Soft Drinks amounts to US$102.28 in 2019. Reading Support In the market for Non-Carbonated Soft Drinks, volume is expected to amount to 18,151.1 ML by 2023. Reading Support The market for Non-Carbonated Soft Drinks is expected to show a volume growth of -0.4% in 2020. Reading Support The average volume per person in the market for Non-Carbonated Soft Drinks amounts to 56.1 L in 2019. Reading Support The average price per unit in the market for Non-Carbonated Soft Drinks amounts to US$1.82 in 2019. Reading Support With a market volume of US$35,609m in 2019, most revenue is generated in Japan. Here you can find more studies and statistics about "Non-Carbonated Soft Drinks".